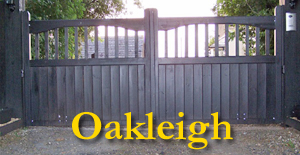 Introducing the latest wooden gate from Hampshire Gates The Oakleigh. As with all our other wooden gates this gate is made from heavy duty planed closed face boards. 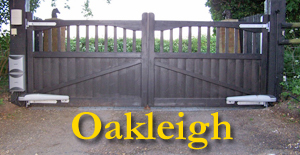 The Oakleigh wooden gate from Hampshire Gates can be manual operation but is ideally suited for our electric gate pack. Both The Oakleigh manual and The Oakleigh electric gate from Hampshire Gates is made from wood from sustainable sources. For more information call us or email us for a fast competitive quotation. All our wooden gates are handmade on our premises in Hampshire to the highest standard using certified timber from sustainable sources at prices we believe cannot be beaten for the quality offered.